Home » Posts Tagged "Holiday Hair"
A veil of hair highlights made of extensions acts like a fringe and was placed over an elegant ponytail knotted and looped on top of the head. 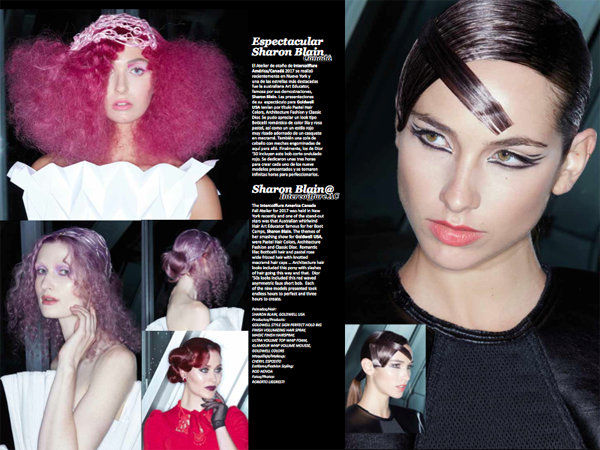 “The updo re-envisions the veil as a hair accessory,” according to Silas & Dorothy Tsang of Blushes in Canada, who said the hairstyling play on texture was inspired by the fashion designer Issey Miyake – “When Modernism Meets Tradition.” This and two other inspirational holiday hair looks by the Canadians made the first page of my column in the December issue of Peluquerias Magazine. Wishing you all a Happy Happy for 2014 and all the very best for The New Year. This illustration was by George Karloulas in the early 90s. Every year he’d send me different masterpieces with Holiday Hair at this time of the year, or earlier so I could publish them in a Christmas issue. He always told me I could do whatever I wanted with his illustrations and sketches because he trusted me, so I have manipulated the colors for this one because I sent the original as a Christmas card before. I am sure he would be thrilled to see this. The original can be seen if you click this link here. 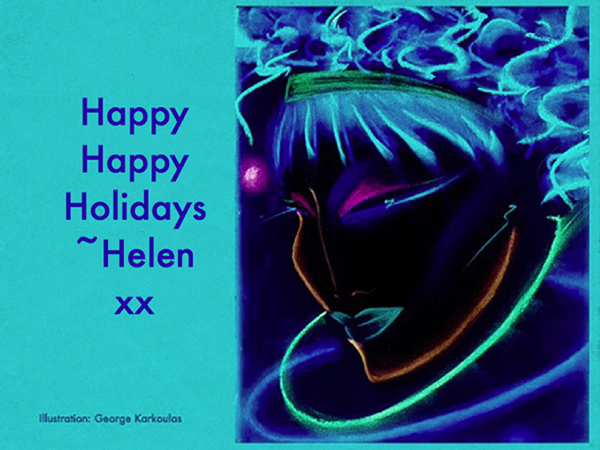 and you can see more sketches by WorldGreat George Karkoulas by clicking here: Miss you madly dear George, especially at Christmas. 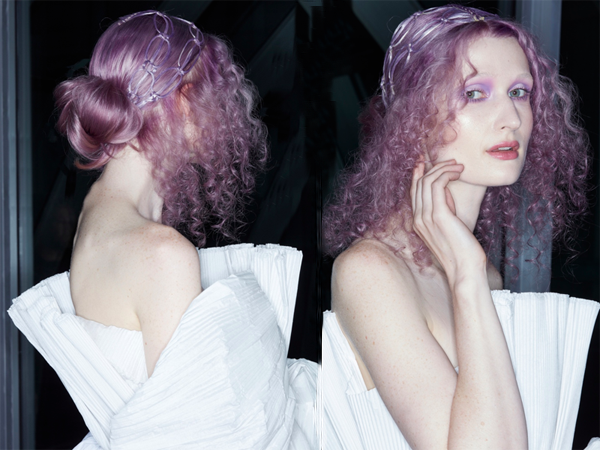 As the Holidays approach, it is time for hair accessories, as in this hair by Garren which literally takes off flying to one side to mimic the movements and shape of the Yves Saint Laurent sequined orchid in the hair of the great Rosie Vela. “One of the most beguiling accessories of the season,” said the editors of US Vogue on their “Unique Experience” page in the 1983 Couture issue. Reposted, larger format. Inspiration for the Holiday Season with back views of some fab hair ideas shown at various New York Fashion Week shows in the 2000s. Top Row: Orlando Pita, Orlo Salon @ Carolina Herrera and Vera Wang (second from left) all using Moroccanoil. Third Row: Esther Langham using Moroccanoil for Nanette Lepore … Nick Irwin, TIGI for Mara Hoffman … Next three: Peter Gray for Betsey Johnson using Redken and @ Peter Gray for Badgley Mischka using Moroccanoil. 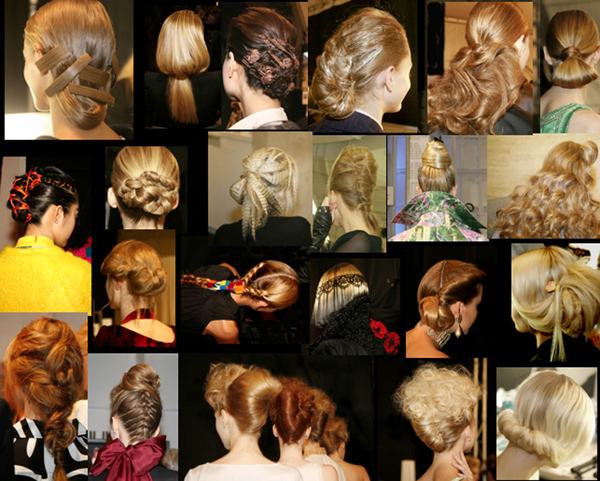 Bottom Row: Antonio Corral Calero, Moroccanoil @ Rachel Zoe … Next four by Peter Gray using Moroccanoil @ Badgley Mischka. For more details and full credits, click New York Fashion Week on the Top Menu of this website, where you will find many more great ideas and some how-to’s. In 1992, the Criss Cross Wrap was an original hair idea invented by Kim Lepine with Renèe Cohen at a La Coupe Creative Evening preparing for the Holiday season.